The Kia GT4 Stinger concept from 2014 was the concept car you wished was real, and it lives—it lives quite wonderfully. The production version naturally isn’t as wild as that concept looked, but it does have a bit more power. 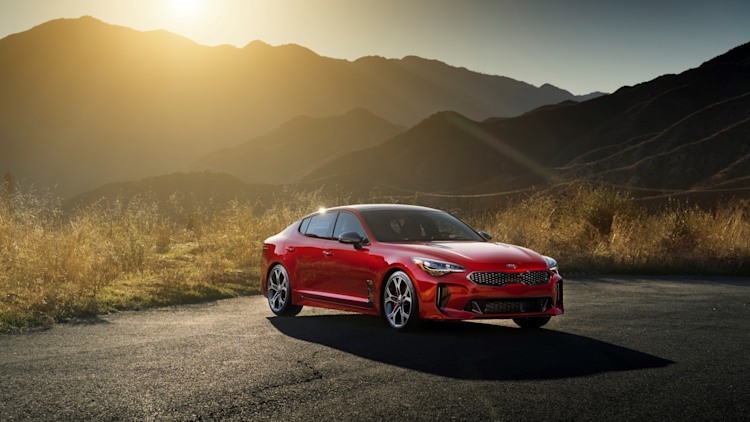 Say hello to the Kia Stinger GT, Kia’s new rear-wheel-drive sedan with 365 horsepower. There were teases of the new Stinger GT in the month or so before this week’s Detroit Auto Show, but it’ll finally be on the floor for everyone to get a good look on Monday. The sauce will come from a 3.3 liter, twin-turbo V6, and it’ll also have 376 lb-ft of torque. Its zero-to-60 time will also apparently be 5.1 seconds. What’s hard to believe here is that this thing is a Kia. The styling and power behind this thing are reminiscent of higher-end manufacturers like BMW or Audi, but here we are, dropping our jaws over a Kia. But let’s get to the sad part here. The car will have an eight-speed automatic transmission, with no manual option. Granted, fewer and fewer new sport sedans these days have those, but it’s still a bummer. Nice. It sounds like we’ll have more for you on Monday. Last edited by JDLM; 2017-01-08 at 03:21 PM.. Throw in Kia's 100k warranty and this looks like a winner. A little more than five years ago, Kia rolled out the GT Concept - a sheetmetal hypothetical musing on where the brand's sporting aspirations might go. 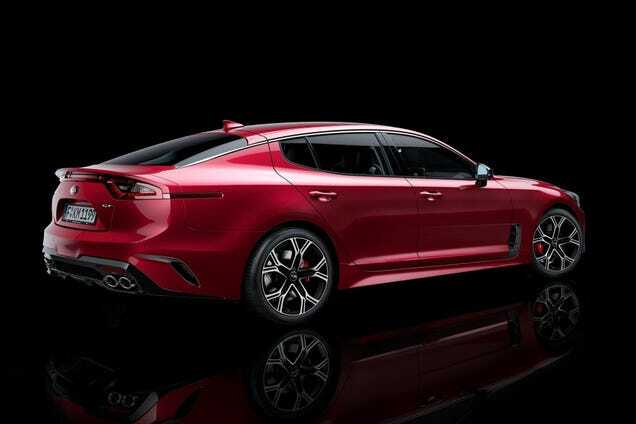 Today on the eve of the Detroit Auto Show Kia unveiled the Stinger, the production version of that 2011 show car. 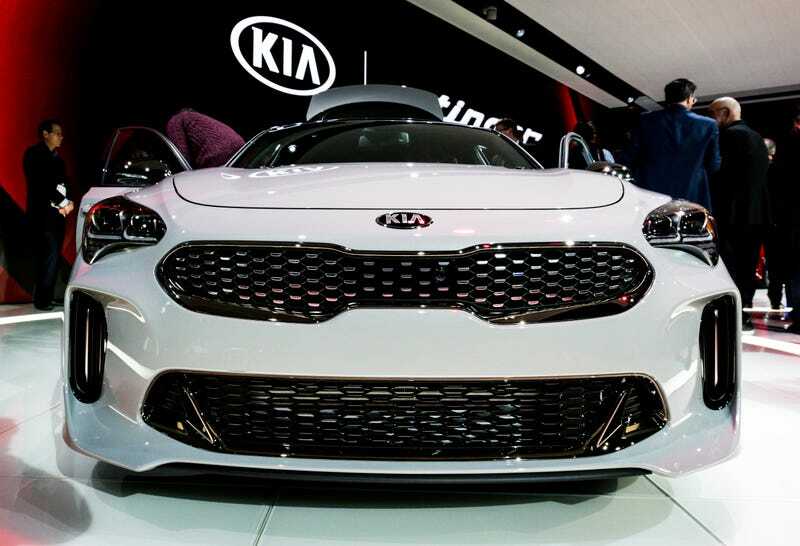 While Kia Motors America says "the Stinger really is a dream car for us," enthusiasts anticipating something a lot racier have sobered up over the distance between the concept and the production reality. 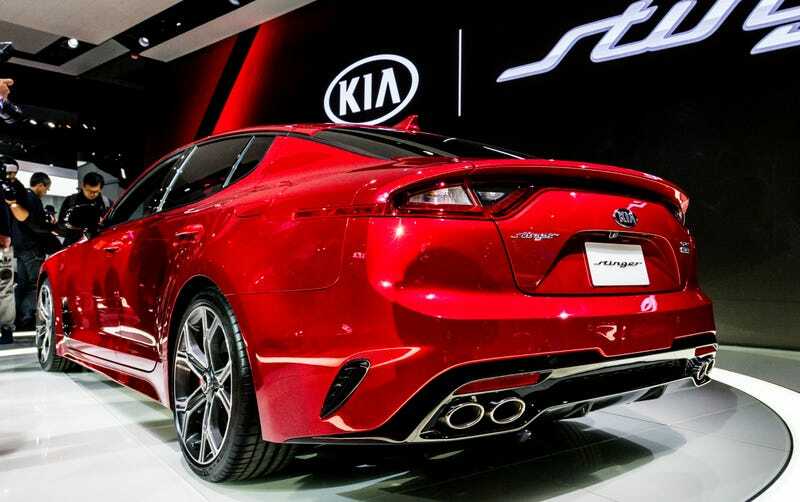 Nevertheless, the new Stinger will be the sportiest Kia ever, and not by a little. 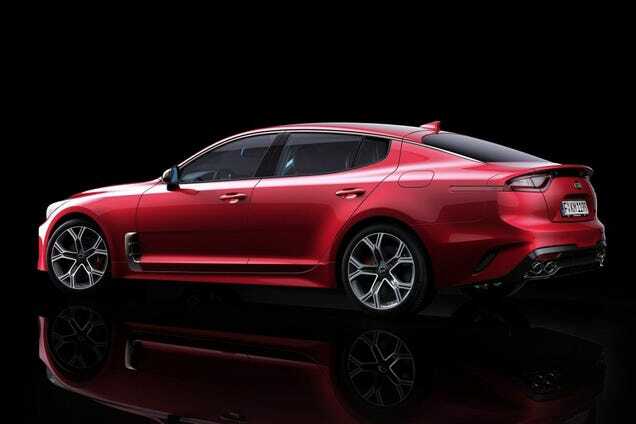 True, there's a lot of Optima in the body - it's too bad they couldn't have made the 2014 GT concept - but details everywhere separate the Stinger from the bread-and-butter sedan. 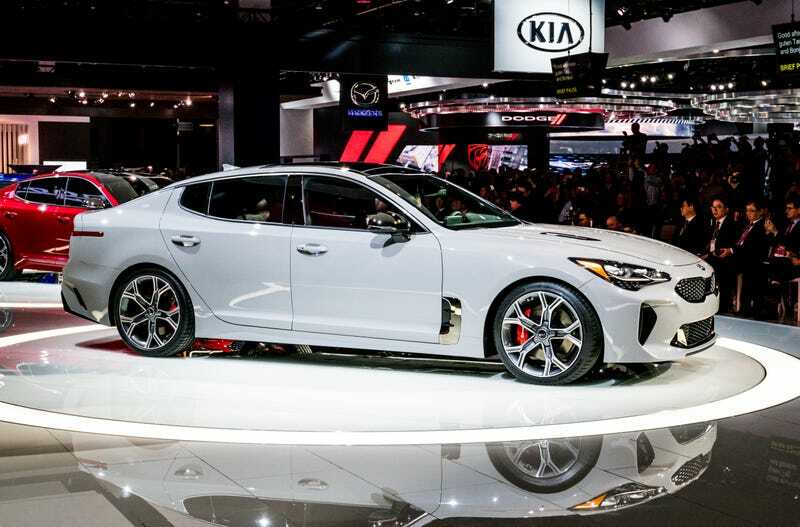 The Stinger's wheelbase is four inches longer than the Optima's, yet overall length is an inch shorter. The brand's corporate face looks to have dabbled in CrossFit, the wide, narrow "tiger-nose" grille jutting out ahead of plenty of black mesh, new LED headlamps, and a new hood with twin hood vents. Side vents and sharp sills carve up the flanks, and side mirrors mount on the bodywork instead of at the A-pillar. In back, the deck lid gently curves upward becoming an integrated spoiler above elongated LED taillights, and a full-length rear diffuser houses four oval tailpipes. The five-seat interior remains a mystery, but Kia says there'll be a dual-zone instrument panel boasting a "large" color touchscreen for infotainment, metal-accented dash gauges with red needles, and a small, color TFT screen in the binnacle for displaying tidbits like G-forces and lap times. Luxury touches include a heads-up display, an optional 720-watt, 15-speaker Harmon/Kardon audio system with two subwoofers, a driver's seat that can be had with air-cell bladders for a snug fit, and lots of driver assistance systems. When the Stinger goes on sale late this year customers get a choice of two engines that are currently still in development. The base model employs a 2.0-liter turbocharged four-cylinder with around 255 horsepower and 260 pound-feet of torque. The upper trim goes with the 3.3-liter twin-turbo V6 found in the Genesis G90 and expected to put out the same numbers: 365 hp and 376 lb-ft. Both motors will shift through the eight-speed automatic shared with the Kia K900 but refined with a centrifugal pendulum absorber for reduced vibration. If all goes to plan, the dash from zero to 62 miles per hour will take 5.1 seconds with the 3.3-liter V6, with top speed capped at 167 mph. Kia picked up ex-BMW M honcho Albert Biermann in 2014 specifically for this kind of exercise. To make the most of the Stinger's talents, Biermann's team tuned five available driving modes: Personal, Eco, Sport, Comfort, and Smart. Each mode commands a particular specific steering feedback, throttle and transmission mapping, and handling feel via the MacPherson front and multi-link rear suspension. Putting the power down falls on 18-inch, 225/45 performance tires on the base model, whereas the 3.3-liter trim comes standard with staggered tires on 19-inch wheels and vented Brembo brakes. The two drivetrain choices are rear-wheel drive for purists, and all-wheel drive for purists who live in regions with seasons. The AWD option comes with a brake-based torque vectoring. A mechanical limited-slip differential graces the all-wheel drive. Kia says it will announce pricing closer to the on-sale date. I think they will need another 10-15 years of solid vehicles to start to overcome the "cheap" reputation. 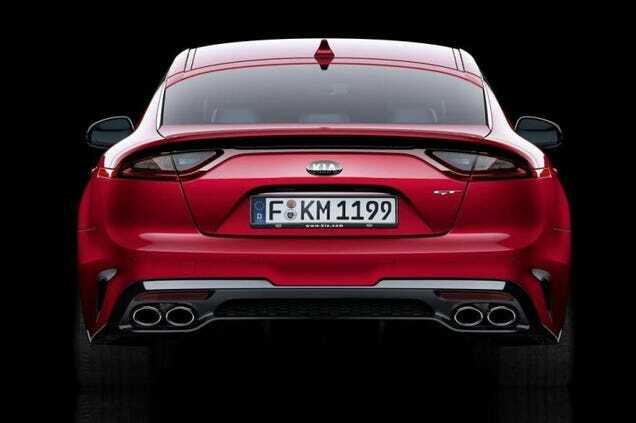 It was at the 2011 Frankfurt auto show that Kia first hinted at the launch of a rear-wheel-drive sports sedan with the unveiling of the GT concept. 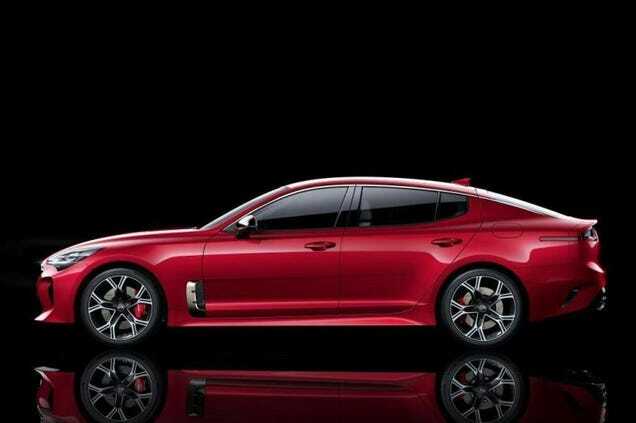 More than half a decade on, the production version of the striking concept has been revealed as the 2018 Kia Stinger. Kia's finally taking the covers off its new coupe-like sedan on Sunday at the 2017 Detroit auto show. 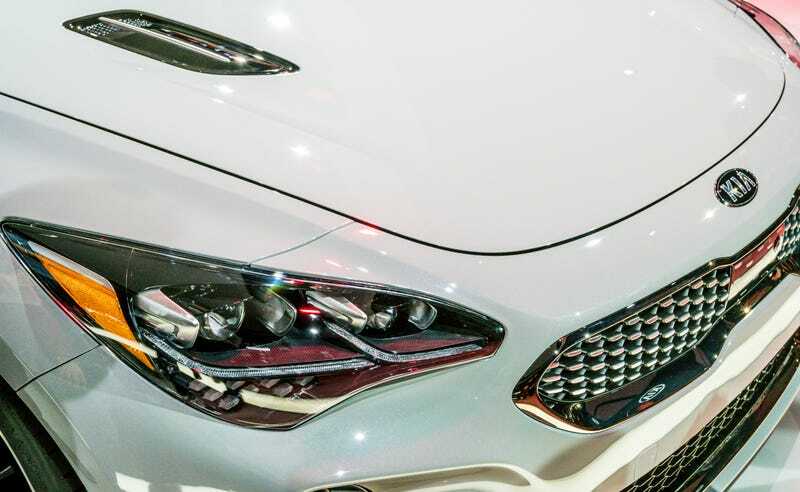 Joining the K900 in Kia’s small but growing rear-wheel-drive arsenal, the car promises to be the most dynamic model ever launched by the Korean brand. Extensive development took place on the Nürburgring, with former BMW M engineering boss Albert Biermann tasked with honing the chassis. Two powertrains will be offered at launch. The base option is a turbocharged 2.0-liter inline-4 delivering an estimated 255 horsepower and 260 pound-feet of torque. Those seeking more performance will be able to opt for a twin-turbocharged 3.3-liter V-6 delivering an estimated 365 hp and 376 lb-ft. The sole transmission is an 8-speed, paddle-shifted automatic. The 4-cylinder Stinger is fitted as standard with 18-inch wheels shod with 225/45-size tires. The V-6 model comes with staggered 19-in wheels with 225/40-size tires up front and a 255/35-size set in the rear. The V-6 model also benefits from Brembo brakes with 4-piston calipers up front and 2-piston calipers in the rear. Performance specs are yet to be announced but we know the V-6 model hits 60 mph from rest in 5.1 seconds. At 114.4 inches, the Stinger’s wheelbase is longer than that of rival coupe-like sedans such as the Audi A5 Sportback, BMW 4-Series Gran Coupe and Mercedes-Benz CLS , which means interior space should be generous for the class. Kia also boasts that cargo space is also larger than in many rivals. Inside, you’ll find all the modern touches as well as a few premium options such as Nappa leather and a 15-speaker Harman/Kardon sound system. The center console is split into two specific areas: the infotainment controls sit below a large color touchscreen, while the climate and ventilation controls nestle beneath. There are also electronic driver aids such as adaptive cruise control, collision warning, and blind spot and cross traffic warning. 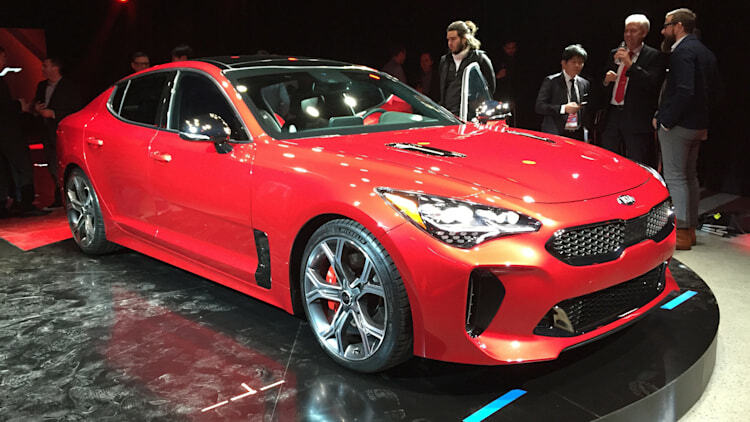 Kia has confirmed that sales of the Stinger will start in late 2017. Pricing information will be announced closer to the market launch but should fall somewhere between the $32k starting price of the Cadenza and $50k price of the K900. 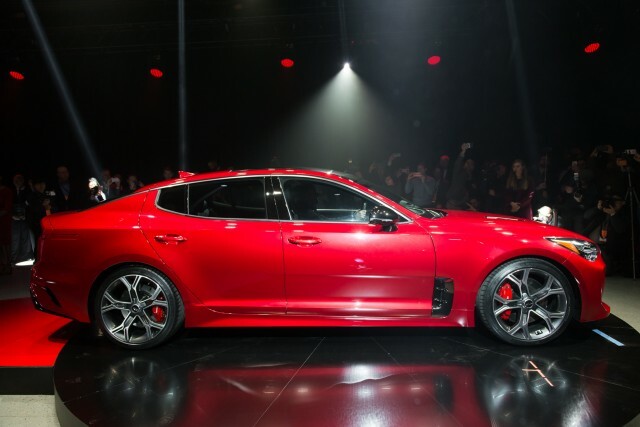 Kia revealed its new Stinger GT hatchback grand tourer tonight. Unfortunately for fans of the clutch pedal, a manual transmission won't come any time soon. Albert Biermann, Kia's head of vehicle testing and high-performance development, told us there are no plans for a manual. 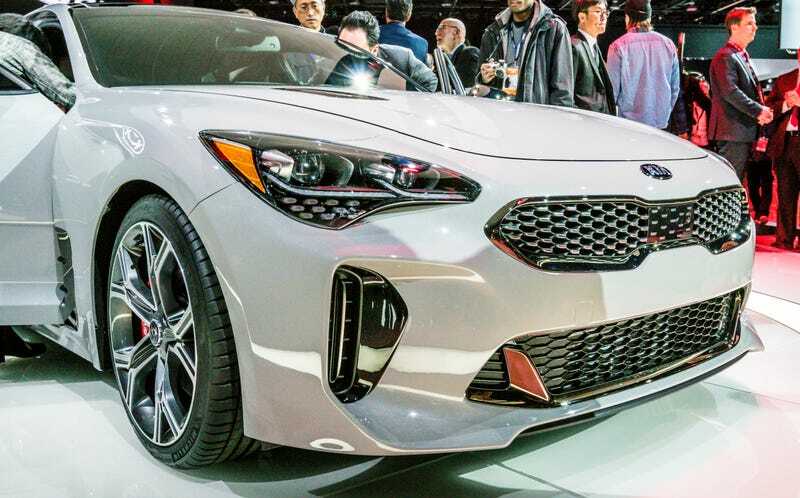 Instead, buyers will have to settle for an eight-speed automatic, which Kia's director of corporate communications, James Bell, said was chosen for its quick shifts coupled with low-speed refinement. Biermann did admit that he would enjoy driving a manual Stinger, if he had one. 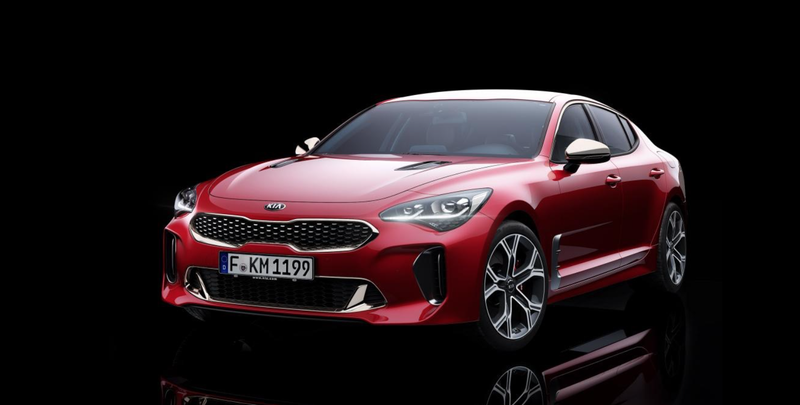 If the lack of a manual transmission has diminished your enthusiasm for the stylish new Kia, perhaps this will help bolster it: Biermann told us that the US will get a market-specific exhaust, and it's louder than what Europe will get. He said that the US has less restrictive exhaust sound regulations, allowing up to 80 decibels. So even though the Stinger GT won't exercise your left foot much, your ears may be in for a treat. We certainly look forward to hearing it ourselves. Agent 001 and I were pretty taken by the direction Hyundai and Kia took in both brands' resurrection. We've been following the Korean automakers' journey since we saw that their products have gotten much better. But, to be honest, it seemed like there was a bit of a stall in the past year for Kia. Well, not anymore. That's because Kia has brought forth something at the 2017 Detroit Auto Show (NAIAS) that sounds tremendous on paper. That would be the all-new Stinger. Coming standard with rear-wheel drive and optional all-wheel drive, it sounds like Kia isn't playing around this time. But, it gets even more serious. 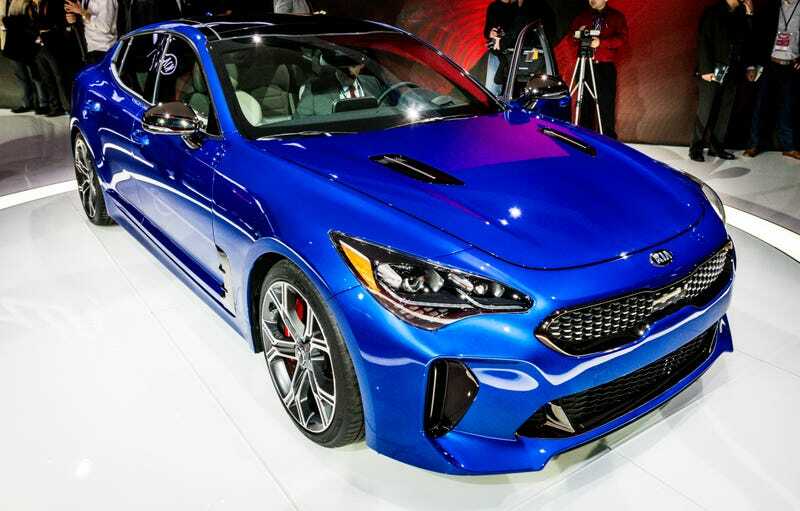 That's because the Stinger will be offered with two engine choices: A 2.0-liter, four-cylinder motor estimated to put out 255 horsepower, and a 3.3-liter V6 good for about 365 ponies. Mated to these will be an in-house developed, eight-speed automatic transmission. Just read around a bit and saw that the AWD v6tt will likely be around $50k. I like the looks of this. We owned a '15 Cadenza, and Whitebird took me for a ride in his K900 and that thing moved our for a land yacht. This should be a nice car for the price point. Did you get rid of the cadenza already? This might be the next car for the wife, if the Regal GS doesn't look good. Damn son, how long did you own it, 2 months? 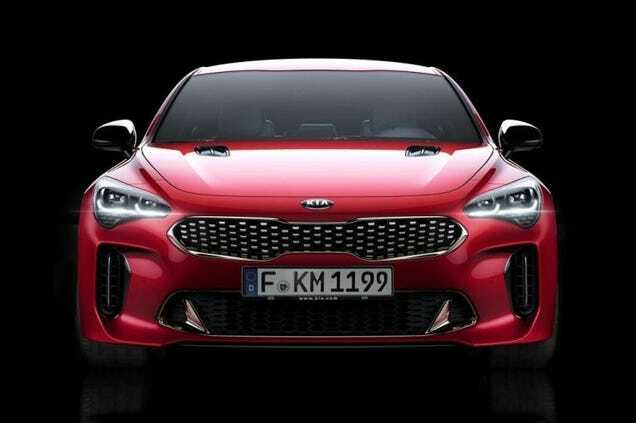 In my own personal opinion as far as looks go, Kia just gave BMW and Audi a giant middle finger in the looks department. I think this is a really nice looking car! I'm not really sure which segment this car is aimed at, but if I had to guess based on the length it appears to be, I'd say it's comparable to likes of maybe the Bimmer 4 series. It'll be interesting to see what the driving dynamics are like and how it measures up to the other established players. This car absolutely kills it in the looks department. Looks a lot better than any of the current BMW or Audi offerings IMO. That's a bold statement, but the more I look at this car the harder time I have arguing with that statement. At least when it comes to four door sedans. Yep, at $50k+ for a fully loaded AWD model, while it packs a lot of the right stuff, it's still a nice chunk of change.